Hoover Fence Single Tennis Court Chain Link Fencing Kit - Color Coated | Hoover Fence Co.
Our single tennis court kit, is offered here in a high quality color coated finish. Kits also available in a galvanized finish. The single tennis court fencing kit has been designed to accommodate the 120' long x 60' wide standard single tennis court and allows both singles and doubles play. 10' overall fence height - 120' long by 60' wide perimeter fence. Top and bottom 1-5/8" horizontal rails coated to match rest of fence. Mid rail available. 4" terminal posts (coating matches finish of fabric). 3" line posts figured on 8' centers (coating matches finish of fabric). 1-3/4" fabric available in vinyl coated 9 gauge. Balance of fence fittings to match finish of framework and fabric. Kit includes two 7' high x 4' wide pedestrian gates with welded frames and lockable latches. All match respective finish of other components. Kit includes material to stretch the transom overtop of the 7' high gates to maintain 10' height. Kits are designed so that you can add the windscreen of your choice. What kind of technical assistance is available for the installation? We off a full installation manual found online. If you have further questions before, during, or after your project, feel free to email or call us directly. We recommend a power auger, professional post hole diggers such as the Nu-Boston digger, tape measure, marker, fence pliers, ratchet and sockets, shovel, bolt cutters, a come-a-long, stretch bar, and a Pul-Jak. We offer most of these tools in our online fence tool catalog. How many gates are included in the enclosure and are the gates lockable? Each enclosure will have two (2) gates, 4' wide. Additional gates can be added for an additional fee and must be specified upon order. You may also change the size of these gates. These gates will have a standard padlockable latch. Our website includes many different styles of gate latches. If a different style is preferred, it must be specified at time of order and cost will be added to the price of the kit. Can we install the gates in a different location than shown on the drawings? Gates may be installed in a different location, however it may or may not affect your material list. Always layout your project and check post quantity prior to concreting anything. If in doubt or you'd like a custom quote, please email or call us with the details so we may adjust the kit material list and prices. We accept no responsibility for material shortages due to changes/ alterations to the standard kit layout. Is everything vinyl coated including posts and hardware? What colors are available? If you purchase a vinyl coated kit, then everything except the nuts and bolts are vinyl dipped. Nuts and bolts are to be spray painted with a matching color. A can of touch-up paint is included with the purchase of a kit. Color Coated Tennis court fencing is available black, brown, and dark green. We also offer galvanized tennis court kits. Can the windscreen be added to the court at a later date? Yes, windscreen may be added at any time. Kits are designed with a maximum post spacing of 8'. High wind areas may require 6' post spacing and larger diameter posts and concrete footers. If you feel you may need this, please email or call one of our sales representatives with the details for a special quote. Do you carry replacement parts should something need replaced? 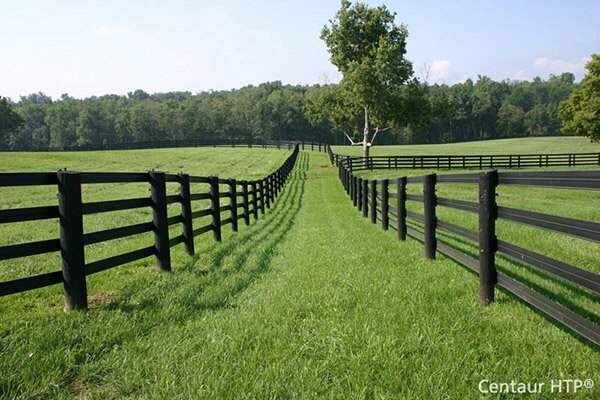 Hoover Fence Co. carries a full line of fence products and materials. All items are available for replacement. Are the net posts included? If you specify the diameter, length, and quantity upon ordering, they will be provided in a matching color. We allow two posts per playing court at no additional cost. The tennis court fence is 10' high and my gate is only 7' high, what do I do? This is normal. Gates are only 7' high intentionally. You will need to stretch approx. 3' x 4' of fence above the gate. We do not include 3' high fence or 4' high tension bars. You will need to cut these two pieces of fence out of the ten foot high fence provided. Tension bar pieces may also be cut from the 10' long ones. Cutting out pieces allows for a more accurate cut and leaves little room for spaces where tennis balls could escape. Other than a padlock, how can I secure access to my tennis court from people I wish to keep out? Other options are available, please consult with one of our sales representatives for advice prior to ordering. Is there a special surface for playing tennis on or is asphalt typical? Unfortunately we cannot offer any assistance in planning or preparation of the surface of play. Our expertise is limited to fence and fence related products. The same applies to rules of play and painting. Please consult an expert in the field of tennis or hard surfaces. Do you know of any installers in my area or companies that carry your products? We do not keep a nationwide network of installers, nor could we keep track of them. We suggest checking your local yellow pages and Better Business Bureau for general contractors prior to hiring anyone. Do you have accessories to go with our new tennis court fencing kit? Absolutely, we carry a full line of sporting goods to compliment the game of tennis. Feel free to browse our online catalog for tennis accessories.